A USAF KC-10 Extender refuels a USAF F-16 Fighting Falcon during the 1999 Air & Space Power Expo. A USAF KC-135 Stratotanker refuels a USAF F-15 Eagle during a training mission over Japan in 2010. This is a list of tanker aircraft (aircraft used for aerial refueling) categorised by type of refueling system. derived from the Airbus A330-200 airliner. 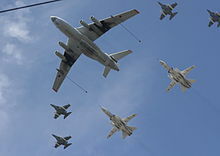 Versions operated by the Australian, Emirati and Saudi air forces are equipped with both a flying boom and hose-and-drogue refueling units. Used only by the IIAF and now the IRIAF, the Boeing 747 is the largest inflight refueling tanker. It is equipped with a single Boeing high speed boom. Boom operator is in a rear-facing seat with a downward facing window with fly by wire controls. Luftwaffe Airbus A310 MRTT in 2007.
derived from the Airbus A330-200 airliner. In RAF service it is exclusively hose-and-drogue and is known as Voyager KC2 and KC3. It is operated under a leasing arrangement and have been made as civilian standard as possible with limitations such as; no self-refueling capability and only the KC3 model (five on order) is fitted with a fuselage mounted high capacity hose-and-drogue system. Airbus A400M, a strategic transport and tanker aircraft in service since 2013. In service with the French Air Force, introduction into the RAF and Luftwaffe by 2014. Used by the US Navy, conversion by Omega Aerial Refueling Services. AdlA KC-135 Stratotankers use the probe-and-drogue system. Colombian Air Force (FAC), a Boeing KC-135 Stratotanker modified with a Multi-Point Refueling System PODS. RCAF used to use CC-137 Husky (Boeing 707) for refueling. Both were retired in 1997. FAC, a 767-200ER fitted with two ARP3 refueling pods under the wings, and cargo door. adapted from the B-29 Superfortress; earlier versions used a "grappling hose" system; later models used a true probe-and-drogue. adapted from the B-50 Superfortress, an improved model of the B-29 Superfortress. Equipped for buddy refueling as "Strike tankers". Taking over tanking duties as the S-3 is retired from service. Dedicated tanker variant of the Skywarrior. Primary US Navy tanker from the Vietnam War until retirement prior to Desert Storm. Equipped for buddy tanking with several nations. Variants of this tanker aircraft also deployed by the Algerian Air Force, People's Liberation Army Air Force, Indian Air Force and Pakistan Air Force. Lockheed HC-130 Hercules and KC-130 Hercules, especially in United States Marine Corps service as well as KC-130s in Argentine Air Force, Brazilian Air Force, Israel Air Force, Indonesian Air Force, Royal Malaysian Air Force, Republic of Singapore Air Force, Swedish Air Force and Spanish Air Force service. Royal Canadian Air Force uses modified C-130H as tankers and the Royal Air Force used modified C-130Ks. equipped for buddy refueling with the UPAZ container as "Strike tankers"
Equipped for refueling in the PLAAF service. Handley Page H.P.54 Harrow used for early in flight refueling experiments by Flight Refuelling Ltd, including supporting Short Empire flying boat crossings of the north Atlantic which proved the feasibility of in-flight refuelling as a regular activity, and later inventing the probe and drogue system. ^ "Boeing 707 - Omega Air Tanker/Transport (United States), Aircraft - Fixed-wing - Military". Jane's. Retrieved 2011-05-19.